The 1956 Ford Thunderbird weighed in at 1 400 kilos (3,088 pounds) with the optional hardtop and sold for $4,344 f.o.b. Oakville, Ontario. 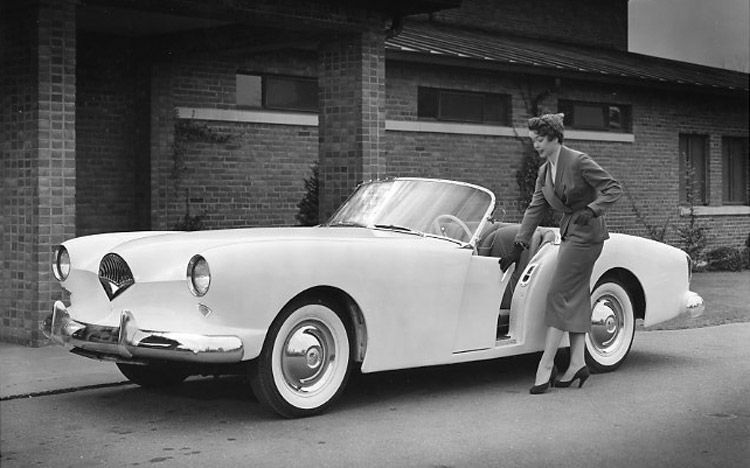 North Americans' post-war fling with the two-seater, European-style sports car was pretty much over by 1955—well the manufacturers were ready to wash their hands, anyway. It was a niche that was simply too small to justify. Nash had been first to market with its American-Anglo hybrid in 1951 but the race-winning, stunningly breathtaking Nash-Healey, with body by Italian design master Pinin Farina, had proven to be a most expensive venture. Some estimates showed that as much as $9,000 was lost on the sale on each of the $6,000 beauties. The pretty Kaiser-Darrin generated little interest. Named for designer Howard "Dutch" Darrin, the fibreglass-bodied car was striking but consumers were afraid to buy a car that might be come an orphan. Kaiser-Frazier, the upstart, post-war company built on the ashes of the failed Hupp and Graham-Paige enterprises, was about to expire. K-F would shortly pull the plug on the North American market, move to Brazil and successfully build vehicles there. 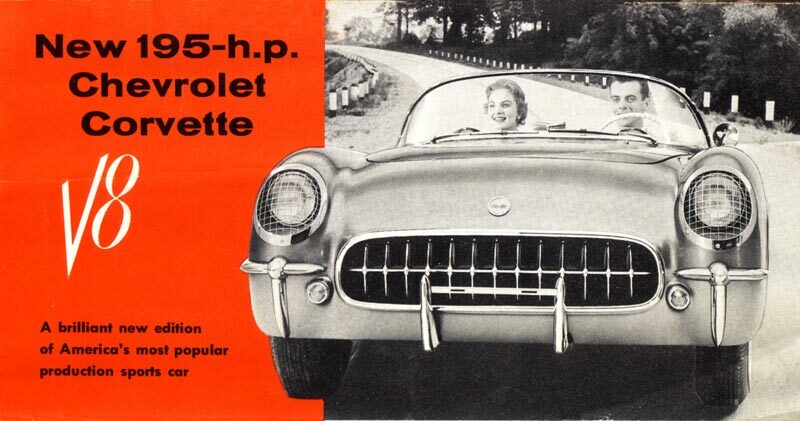 The boys at Chevrolet were more than ready to chuck the slow selling plastic-bodied Corvette. The dream car had first appeared at GM's 1953 Motorama. Six months later the two-seater went into production. The availability of only a six-cylinder engine mated to the Power Glide two-speed automatic transmission was disappointing to buyers and sales were dismal. Just as General Motors was ready to axe the car, Ford unexpectedly fielded a smartly styled Thunderbird for the 1955 model year. The designers in Dearborn built a beauty and wrapped it in a package that--like baby bear's porridge--was just right. 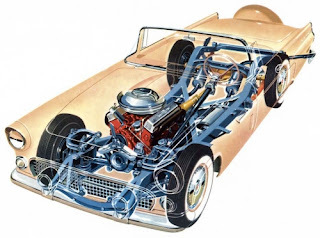 Nash and Kaiser didn’t take a second kick at the can but Chevrolet’s staff studied the T-Bird and decided to spare the axe and improve its bowtie roadster. Engineers and stylists had a lot to study; Thunderbird was most impressive. The Thunderbird Special V-8 generated 225 horsepower. First, the Bird moved courtesy of a sweet V-8. There were reports of “screaming acceleration” and “flying high-speed runs” when the car was worked out on test tracks. With a 4.7-litre (292-cubic inch) mill, aided by a four-barrel carb and dual exhausts it should have taken first place at the National Speed Championships at Daytona Beach in the unlimited competition for acceleration—and it did. The fast Ford beat both American and European cars in all prices and classes. Secondly, the 2 590-millimetre (102-inch) wheelbased Thunderbird didn’t look like a European sports car. 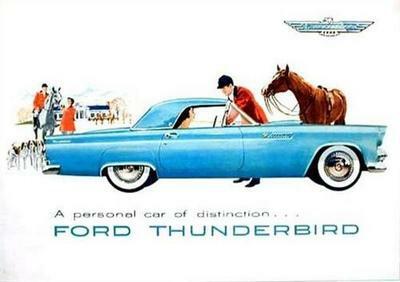 Deliberately North American in appearance, Thunderbird carried a very strong resemblance to the rest of the Ford family. It even shared taillights and headlight bezels with bigger Fords. Its interior was dressed to the nines with luxurious vinyl fabrics and ritzy touches not commonly seen in sports cars. Canadians got to see the 1955 Thunderbird when it was unveiled at dealerships on November 13, 1954. There weren’t a lot of other cars on hand in the showrooms; workers at Ford of Canada were on strike. Being imported from the USA, Thunderbird production were not affected by the work stoppage in the Windsor and Oakville plants. Sales opportunities for Thunderbirds were limited to folks willing to lay down $4,090 in cash or to finance the amount. A six-passenger Ford Mainline Tudor sedan sold for $2,152. 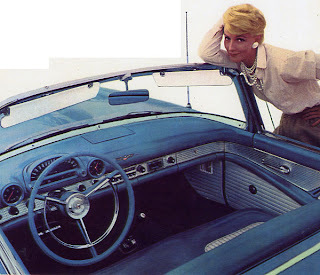 The plain-Jane, however, did not have the snob appeal or the pizzazz of the snazzy two-seat hardtop coupe. Ford could and would sell wheels to both markets. While styling was definitely North American, the Ferrari-like grille gave the 1956 Thunderbird a European flavour. When Thunderbird returned for the 1956 season, it arrived with a minor trim shuffle and some real improvements. 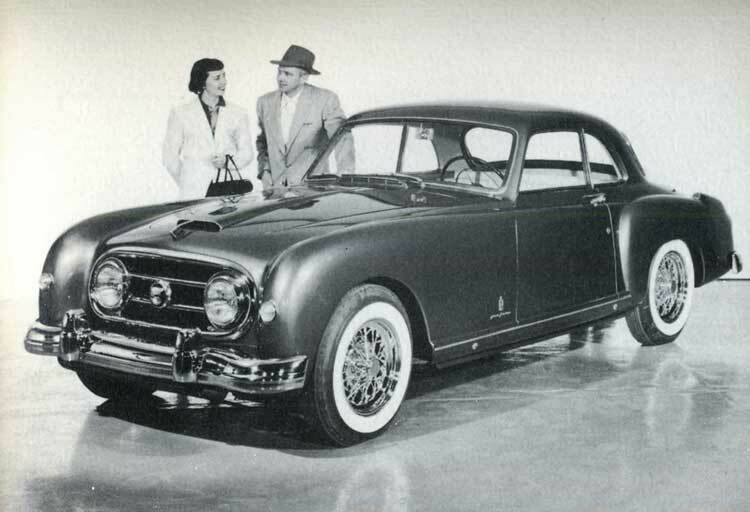 The big visible news was the continental spare tire kit and a porthole window to punctuate the massive C-pillar in the hardtop. Cowl vents adorned the slab sides and made the interiors much cooler than before. 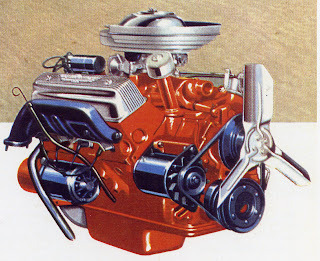 Almost unnoticed and virtually unmentioned was the change from 6-volt to 12-volt electrical systems. 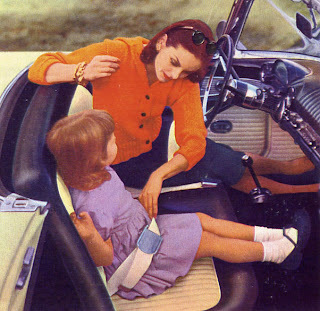 First seen in the 1950 Nash, Ford adopted seatbelts for 1956 as a safety measure. Thunderbird was given the Lifeguard Design safety feature package adopted by all Ford, Mercury and Lincoln cars for 1956. Researchers at Cornell University documented that automobile safety had not improved within the last decade. Ford saw the challenge as a marketing opportunity and pulled together a safety package. Instrument panel padding of a space age material, proven to be five times more shock absorbent than foam rubber, was introduced. A deep-centre, Y-shaped steering wheel was created to lessen injury upon impact should the driver be thrown into the steering column. Double-grip door latches reduced the possibility of doors flying open and occupants being thrown from the vehicle during an accident. Finally, seat belts were introduced as a way of restraining passengers securely within the cabin. For this, Motor Trend magazine would award Ford its first ever Car of the Year Award. Interior of the 1956 Ford Thunderbird was as sleek and racy as its exterior. The Thunderbird’s cabin was nothing short of sumptuous with a dazzling engine-turned aluminum strip to set off the instrument panel. A tachometer and an electric clock flanked the Astra-Dial speedometer that showed a tantalizing top speed of 150 miles per hour. Interiors were swank with plush vinyl upholstery; colour choices were white on black, red, tan, green, brown or peacock. Colour choices for the Thunderbird’s second year were Raven Black, Colonial White, Buckskin Tan, Fiesta Red, Peacock Blue, Goldenglow Yellow, Thunderbird Gray, Sunset Coral and Thunderbird Green. In addition, 15 two-tone combinations were offered at the outset of the season and that was revised to 13 two-tone colour combos later in the year. The glass-fibre top could be had with or without a porthole window this year. It was offered in black or white or was available in a colour to match the body. Cutaway view of the 1956 Thunderbird. Optional equipment for one’s T-Bird included Swift Sure Power Brakes, Master-Guide Power Steering, 4-Way Power Seat, Power-Lift Windows; a convertible fabric top, a tonneau cover, the Lifeguard instrument panel padding and cushioned sun visors; seat belts, the I-Rest tinted safety glass; turn signals; Auto-Wipe windshield washers; special fuel-and-vacuum pump unit; a full-flow oil filter; an engine dress-up kit; Ford-O-matic transmission or Overdrive; MagicAire heater; radio; rear fender shields; full-wheel covers; wire-wheel covers and whitewall tires. Thunderbird did well on the market, outselling Corvette by a four-to-one margin. The triumphant T-bird would return for a third year with big changes that would make it even more popular.